Looking for mathematics books? 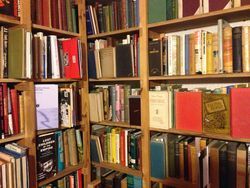 Biblio.co.nz hosts hundreds of of the finest online book stores and booksellers, including specialists in mathematics. Use the list below to locate a specific specialist bookseller or book store near you. Or, use the form below to search the inventory of all booksellers who specialize in mathematics. We specialize in non-fiction technical books and college textbooks. The Sacred Science Institute specializes in rare books in the fields of Metaphysical & Scientific Cosmology, Financial Market Forecasting, Astrology & Astroeconomics, Sacred Geometry, Rare & Alternative Science, Occultism, Esoteric Science, Freemasonry & related subjects. Books sold are from my private collection.